What Does Wall Street See for PetroQuest Energy's Q4? 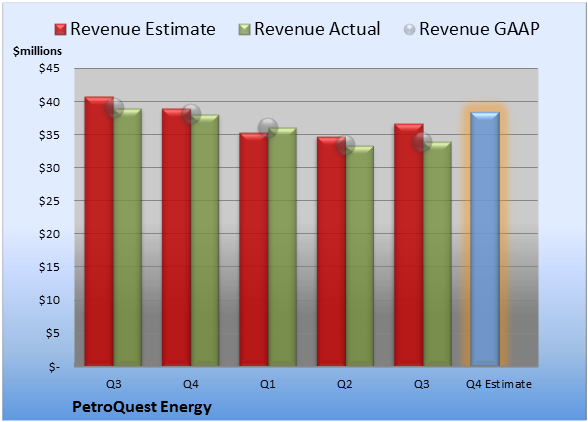 Comparing the upcoming quarter to the prior-year quarter, average analyst estimates predict PetroQuest Energy's revenues will grow 1.0% and EPS will compress -42.9%. The average estimate for revenue is $38.5 million. On the bottom line, the average EPS estimate is $0.04. Last quarter, PetroQuest Energy chalked up revenue of $34.0 million. GAAP reported sales were 13% lower than the prior-year quarter's $39.0 million. Last quarter, non-GAAP EPS came in at -$0.05. 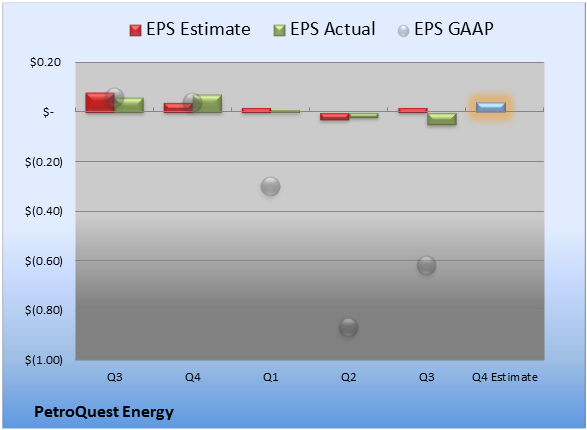 GAAP EPS were -$0.62 for Q3 compared to $0.06 per share for the prior-year quarter. For the preceding quarter, gross margin was 69.0%, 70 basis points worse than the prior-year quarter. Operating margin was 4.6%, 1,360 basis points worse than the prior-year quarter. Net margin was -110.0%, 12,280 basis points worse than the prior-year quarter. The full year's average estimate for revenue is $143.6 million. The average EPS estimate is -$0.02. The stock has a two-star rating (out of five) at Motley Fool CAPS, with 427 members out of 454 rating the stock outperform, and 27 members rating it underperform. Among 107 CAPS All-Star picks (recommendations by the highest-ranked CAPS members), 100 give PetroQuest Energy a green thumbs-up, and seven give it a red thumbs-down. Of Wall Street recommendations tracked by S&P Capital IQ, the average opinion on PetroQuest Energy is outperform, with an average price target of $8.14. Looking for an alternative to PetroQuest Energy? By investing in this multibillion-dollar energy company, you can get in before its stock rebounds, when natural gas prices eventually do turn upward. And until natural gas prices do rebound (which a top Motley Fool analyst expects will happen by 2014), you can cash in on its stable 5.7% dividend. Click here for instant access to this free report.